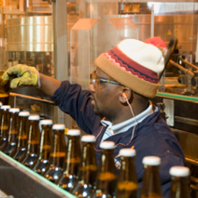 The negative impact of the global recession on South Africa's manufacturing sector was significant. In 2009 the utilisation of production capacity fell from 84% to 78%. The portion of underutilised capacity attributable to insufficient demand rose to 15%. Today, capacity utilisation stands at 81%. Although this level falls short of the pre-crisis level of 85% in 2006, it is an important indication that the economy is recovering from the impact of the global recession. Economic uncertainty in the Eurozone is a major factor impeding full recovery in the sector. Capacity utilisation refers to the extent to which a country uses its installed manufacturing production capacity. It therefore reflects the relationship between that which is actually produced and that which could be produced at full capacity.